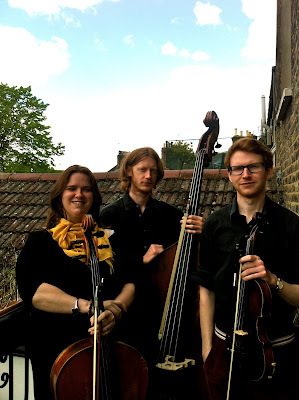 I am excited about my new three-string instrument project Spectrum, it comprises myself on cello, Richard Jones on Violin and Nick Pini on double bass. We will be performing at the Brunel Museum in Rotherhithe on 4th July – suitably Independence Day, and even more suitably, we will be playing a programme of Jazz Standards. The idea for Spectrum came about a few months ago when I met a very great musician and jazz violinist Richard Jones, and we found that we shared a similar desire to create an improvising string group focussed on jazz repertoire, as well as original compositions. I met Nick Pini though my work with accordionist and pianist Maurizio Minardi, and admired his playing very much, so…well, here we are. Richard is particularly unique, as, unlike most string players – myself included, who veer off into diverse musical activities, he has never been classically trained, and his style of playing reflects this very much, particularly in his use of the bow. He is an especially ear-based player, as well one of the most natural string players I have encountered, and has an ability make the fiddle sound like pretty much anyone from Jimi Hendrix to Disney’s Dopey, as well as having some fairly scary jazz chops. Nick Pini is probably familiar to many as the great bass player that he is, performing with many musicians on the scene, and I am sure needs no introduction, he will be laying down the bass for us, as well as throwing in some of his fine solos, and his fine chamber musician's sensitivity. My role in the group is an interesting one for me, as I am quite often end up performing the ‘comping role, so it is a fascinating challenge to find ways to voice chords as a pianist or a guitarist might on the cello, as well as taking melodic lines. For once, I am not ending up playing bass on the cello! In any case, this project is one that I am very much looking forward to developing and exploring, and it would be lovely to see some friendly faces in the audience on 4th July at the Brunel Museum, near Rotherhite.